This is a little bit of a cheat coffee cake. It has all the bells and whistles of a coffee cake, but it’s made with a boxed cake mix and has more of an gooey butter cake feel. 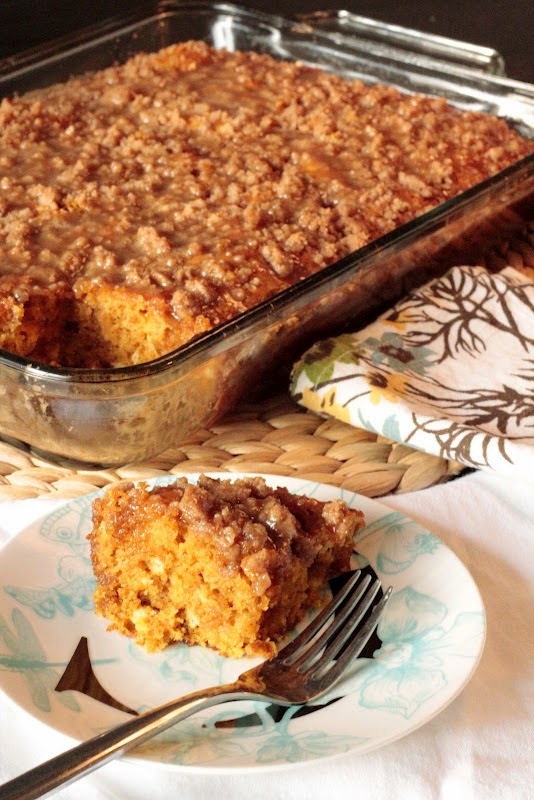 It’s less traditional coffee cake, but still totally and ridiculously awesome. The addition of the pumpkin puree really takes it over the top for me. I would highly recommend making this if you need a dessert in a hurry. It comes together very quickly and what’s even better is that you don’t even need the mixer, just a fork and a wooden spoon. In a large bowl mix together the water, pumpkin, eggs, 1 Tablespoon of vanilla, and pumpkin pie spice until well combined. Add the cake mix and baking soda and mix until just combined.